Putin Starts Historic Fourth Term As Russian Leader : The Two-Way By the end of his new presidential term, Putin will have served longer than any other Russian leader since Communist dictator Josef Stalin. Vladimir Putin speaks with his hand on the Constitution during his inauguration ceremony as new Russia's president in the Grand Kremlin Palace in Moscow, Russia, on Monday. 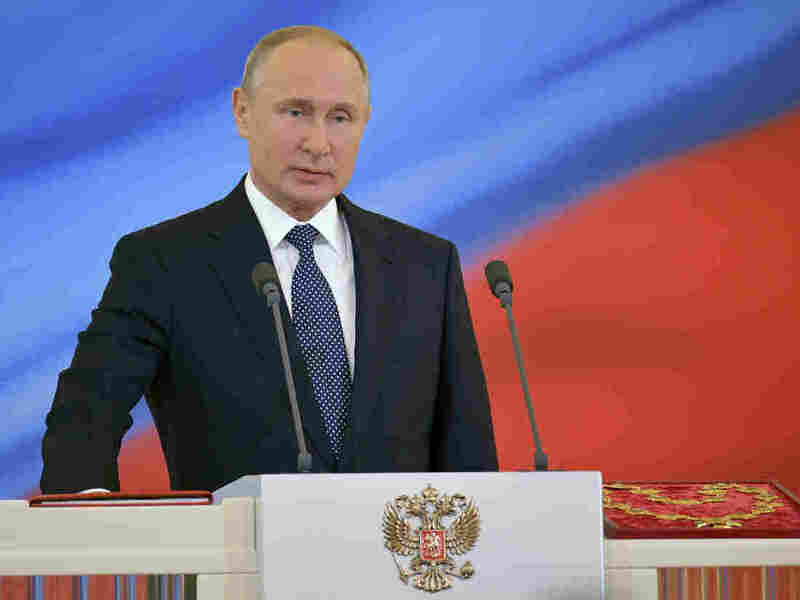 Russian President Vladimir Putin took the oath of office for a fourth term as president – solidifying his place as the country's longest-serving leader since Communist dictator Josef Stalin. Putin easily won re-election in March after his chief opponent was disqualified. The elaborate Kremlin ceremony took place at the Grand Kremlin Palace at noon Moscow time. By the end of his new term, Putin will have ruled for 24 years. Although Russia's constitution limits the presidency to two terms, Putin – who took over from an ailing and embattled Boris Yeltsin in 2000 – skirted that limit by swapping posts with Prime Minister Dmitry Medvedev for one term, from 2008 to 2012. In a brief speech, Putin thanked Russians for their support and promised to do everything to make the country prosperous. "I understand my colossal responsibility," he said. "I believe that the entire point of my life is to serve Russia." He said only a free society could create the conditions for technological and economic breakthroughs necessary for Russia's development. The remarks came in sharp contrast to the weekend leading up to his inauguration, which saw hundreds of arrests of anti-Putin protesters. Putin's term begins amid historically poor relations with the United States over efforts to interfere in the 2016 U.S. presidential elections, international concern over Russia's human rights record and the lingering geopolitical fallout from the 2014 decision to secretly occupy and annex Crimea from Ukraine. Even so, as The Associated Press notes, "his image is ubiquitous at home and effectively Russia's 'brand' worldwide." "A fixture on state television, Putin shows up daily - giving instructions to officials, meeting workers and visiting heads of state, surveying new medical, aerospace and defense facilities. Not infrequently, he shows up in a more casual setting such as playing hockey or skiing," the AP notes. Meanwhile, the Kremlin's most vocal critic, 41-year-old attorney Alexei Navalny, was released from jail after being arrested over the weekend for leading anti-Putin protests. He said he was out on bail and had been charged with organizing an unauthorized meeting and resisting arrest. Each charge carries 15 days in jail. Navalny, who rose to prominence via social media and now heads his Anti-Corruption Foundation, sought to challenge Putin for the presidency in the March 18 election, but was denied registration as a candidate. He led a quixotic boycott of the election, which saw Putin facing seven hand-picked candidates, none of which seriously campaigned. The outcome of the election was never in doubt. Even so, Putin does enjoy considerable support among ordinary Russians. A poll published shortly before the election by the state-owned Russian Public Opinion Research Center had Putin with a 69 percent approval rating, although over all, the government has a negative approval rating.